Though it’s uncommon that a person who becomes a sales marketing manager has little to no experience selling a product or service, it does happen. -	A marketing superstar is offered a promotion and the new position includes supervising the sales department as well. Though he or she has a great deal of marketing know-how, selling experience is not part of his or her credentials. -	A group of entrepreneurs starts a business and one of them is named “sales marketing manager”. Despite possessing an interest in sales and marketing, he or she may have little practical expertise in either. -	A company downsizes. One of the employees who survives the plethora of job cuts is given the title of sales marketing manager despite his or her lack of experience. In each of those situations, the individual who has been given the title “sales marketing manager” can absolutely succeed, but he or she will need to understand the art and science of selling as soon as possible. The following outline gives the person without sales training some realistic ways to learn how to sell a product or service. Nothing will give the novice sales marketing manager a faster appreciation for sales than trying to sell something. This can be accomplished face-to-face, online or over the telephone. Start with a small ticket item, not a complicated million-pound piece of machinery. The object of this exercise won’t be to sell the product or service, but to gain the experience of having potential buyers say “no”, become hostile, raise objections or, if all goes well, agree to buy the goods or service. If there isn’t a reasonable on-the-job opportunity to sell, the sales marketing manager may wish to fundraise for a local or national charity instead. This is still “selling”, in a sense. However, be particular about which you choose to attend, as not all are as reputable as others. 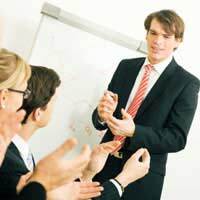 Look for a sales training programme that is very detailed and challenging. After all, if you want to learn quickly, you’ll need to be taught a variety of skills from leaders in the field of selling. If you have a friend or colleague who is a sales person (and who does well at his or her job), ask if you can “shadow” him or her for a week. By assisting on sales calls, you’ll be able to obtain firsthand knowledge of the sales process. Be sure to ask questions during your “internship” as well as keep a journal or log of the experience. Then, you can refer to your notes as needed. There is no lack of sales-related books and magazines, so why not make use of them as a resource? Even if you only spend an hour or two each evening browsing the Internet, you’re certain to find nuggets of quality sales advice. One caveat, though – your business may have a different sales cycle and methodology than others. What you’re researching will be general sales principles, not necessarily how to sell what your company offers.